Hosting a Yakitori dinner party is probably the easiest type of dinner party you can host. This is the perfect dinner party format as gets your guests involved! It doesn’t require tons of prep work and as a host, you get to spend all of your time with your guests since you are not trapped in your kitchen cooking. 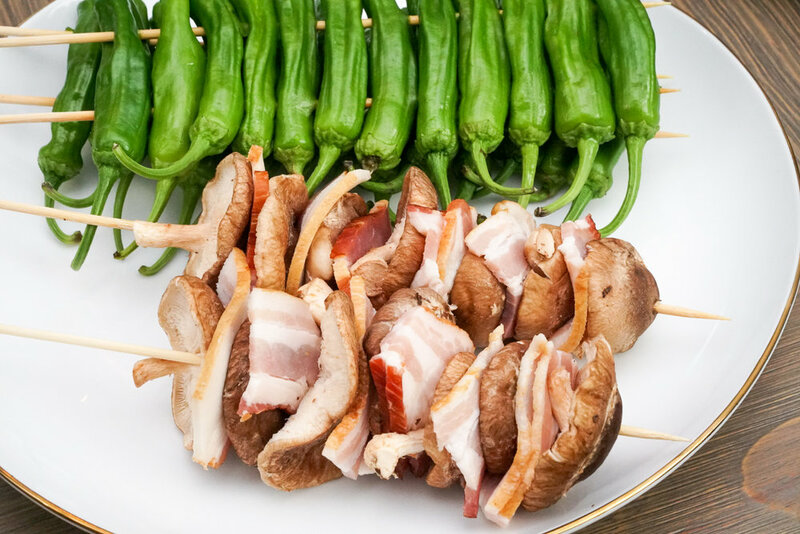 Yakitori is keto, gluten-free, and paleo which is a surefire way to host a dinner party that meets many guest’s dietary needs. Yakitori is a Japanese dish that involves skewering chicken and grilling them over charcoal. Technically you could have a yakitori party with your traditional BBQ grill, but we wanted a more interactive experience, which was a cinch with KRUPS’ Stainless Steel Smoke-less Indoor Grill (you can find it at Macy’s). You can cook all types of food on it indoors, which is great for winter months and for those who don’t have access to a patio for an outdoor grill. We think it is also a perfect yakitori grill. It heats up quickly and has two temperature zones, which is perfect for grilling different types of skewers. The best part is that you can put it right on your dinner table for an active cooking experience! The crowd favorite was the chicken satay, which technically is more of a Thai recipe than a Japanese dish, but it is chicken, it is on a skewer and we love it, so there. This is a recipe we created about two years ago. Start by using our recipe to create the marinade for the chicken tenders. While the meat is marinating, whip up our homemade peanut dipping sauce. It was so good that everyone was dunking everything in it all night. Another dish we prepared was negima yakitori. This classic dish is comprised of pieces of chicken thighs skewered between scallions. Simply cut the chicken thighs into 2 inch pieces, season them with salt and pepper, and alternate skewering the meat and scallions. Keep the meat pushed together tightly on the skewer, this helps to keep the meat moist. Once it is done, finish the yakitori dish by basting the skewer in tare (make your own or feel free to use store-bought teriyaki sauce) and garnish with toasted sesame seeds. Dunk them in additional tare as a simple dipping sauce. For veggies, we skewered shisido peppers though two skewers, which helped to prevent it from spinning on the skewer. We also layered pieces of bacon in between shiitake mushrooms. The drippings from the bacon helped to add more flavor to the mushrooms. Plus, you can never go wrong with adding bacon to anything. Next time, we will also grill up some Japanese eggplant and baby bok choy too. While you’re getting ready to grill, add some jasmine rice to a rice cooker for an easy side dish to help fill everyone up. From a cocktail standpoint, nothing is easier or more on-theme than serving up some sake. We grabbed Austin’s-own, Texas Sake. Serving three sake varieties means there is a sake that everyone could enjoy: Nigori, Junmai, and their Oak Junmai which reminds us of a Japanese whiskey. We started by plugging in the KRUPS’ Stainless Steel Smoke-less Indoor Grill at the center of the dinner table and featured our prepped skewers on platters alongside the grill. We rubbed some vegetable oil on the grill grates and set one side to 475 degrees for the meats and the other to 400 degrees for the veggies. Let your guests pick a skewer of their choosing and have them grill their meat, flipping halfway until the meat is fully cooked. Repeat until all the food is consumed! If you’re interested in hosting your own yakitori parties at home, you can get your indoor grill here and skewers online or at your local market. Let us know what you whip up!